Dmytro Kupriyan (b. 1982) is a photographer and a photojournalist from Kyiv, Ukraine. In 2014 and 2017 he travelled to the Crimea and the East of Ukraine to document the tumultuous events of the “Russian Spring”. The Russia's aggression in Ukraine started with the annexation of Crimea in February, 2014 and spread over Eastern Ukraine in the spring, hence the “Russian Spring” political label. This "proxy war" (which initially Russia pretended not to be part of) quickly developed into a succession of full-fledged military conflicts until it froze down to its today's sluggish, but still deadly state. Kupriyan’s several bodies of work on display at VASA refer to different time periods and geographic locations of this war. The “antebellum” phase of the conflict - the riots in the east of Ukraine and Crimea before the falsified Crimean March 18 Referendum are shown in his reportage video War. Ukraine. The Beginning. His later photos from the war action zone in the Donbass area are shown in the Selected Reportage portfolio which depicts the Ukraine’s side of the war, its protagonists and its everyday life events. The images are also shown in the When The War Is Over video accompanied by an audio of local radio stations broadcasts mixing Soviet-era pop songs with news reports from the front line. The war zone is where shells, mines and missiles explode day and night, and the fragments, evidence of the Russia's state-instigated aggression, are easily found everywhere. Inevitably, Kupriyan started documenting that evidence. 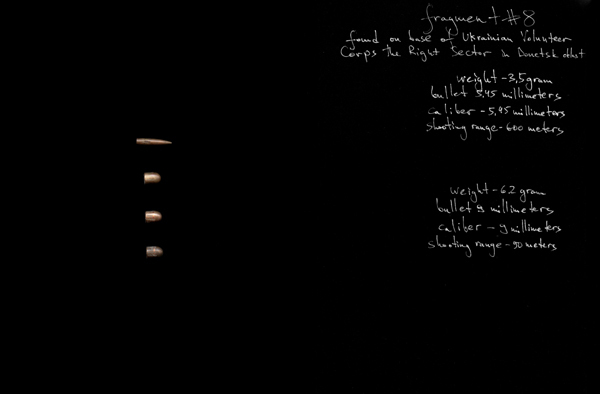 His Fragments of War project (2014 - 2017) is composed of the scans of those fragments with additional technical description specifying the weapon, the caliber, the place, day and time it was found. Thus the resulting image becomes a double-edged sword in the artist's hands: an exhibit for the Hague court suit, on the one hand, and a conceptualist work of a modern artist, on the other. Another step forward was Kupriyan's When The War Is Over series of images (2017). "All wars come to an end, sooner or later", writes the artist in his statement. "This project is a speculation on what happens afterwards, to see the objectives and the problems that await us. First of all, it is the problem of a divided Ukraine's society, of the people that by the force of circumstances found themselves on the opposite sides. Establishing civil dialog between these two groups of the country’s population will decrease the degree of aggression that is already ultrahigh." Apparently, this notion is underestimated in the society, so Kupriyan literally gets the message across by computer-projecting “When the war is over” inscription onto the ruins of the Eastern Ukraine towns demolished by the artillery fire, and then photographs the resulting pictures. To widen his audience, the artist writes it in both Ukrainian and English. For an artist making a work of current interest the means of expression remain a matter of choice: a documentary image, often leaving the interpretation to the beholder's eye, or a contemporary art piece where the reading or interpretation can be prescribed. Dmytro Kupriyan’s work oscillates between the two extremes, in effect covering the entire range of approaches. There is no question mark in Kupriyan's “When The War Is Over” projection. Or is there?